The Festival of British Archaeology is one of the biggest archaeological events in the world – and Leicestershire and Rutland have more events than any other area of Britain! Discover the rich heritage of Leicestershire and Rutland during this fortnight with a fascinating range of events, talks and guided tours from some of the county’s archaeological experts. Burrough Hill Country Park, Somerby Road, Burrough on the Hill, LE14 2QZ. Visit the county’s finest Iron Age hillfort and find out what University of Leicester archaeologists have been finding in the final season of a 5 year programme of excavations on the site. Learn about life in a roundhouse and watch combat displays. Guided tours of the site and excavations throughout the day. Come to this talk, organised by Hinckley Archaeological Society, with 3 guest speakers: Peter Liddle, Stephen Dean of Staffs County Council and Stuart Palmer of Warwickshire Archaeology with updates on 3 important archaeological projects. £5 (including tea or coffee) Contact Malcolm Lockett 01455 634765 for further information. Prior booking not essential. June 30th – Friday 25th July. 11am to 4pm (Closed Sunday; weekdays closed 1 -2pm) Ashby Museum, North Street, Ashby de la Zouch, LE65 1HU. An exhibition featuring the archaeology of Ashby de la Zouch and the surrounding area. Come and see the many and varied things found in the Ashby area dating from pre-history until today. A colourful history of Ashby in cartoons is on display for younger visitors. Saturday 12th, Sunday 13th, Saturday 19th, Sunday 20th, Saturday 26th, &-Sunday 27th July: 2.30pm – 5.00pm Hallaton Museum, Churchgate, Hallaton, LE16 8TY. A new free exhibition examines the King’s reign and what life was like in Leicestershire during the late 15th Century. Over 4,000 Stone Age flint tools have been found in the Fosse Meadows area over the last few years by Hinckley Archaeological Society. Come along to the Hinckley & District Museum to see some of these on display and find out when, what and how they were used! Sunday 20th July: 1pm – 5pm. Grace Dieu Priory, near Thringstone, Leicestershire. Meet at the Bull’s Head Car Park, LE67 8LR. Saturday 12th July: 2.00 – 4.00pm. Meet in the car park at Burrough Hill Country Park, Somerby Road, Burrough on the Hill, LE14 2QZ. Visit Leicestershire’s finest hill fort with University of Leicester archaeologist, Dr. Jeremy Taylor, and Leicestershire archaeologist Peter Liddle. This will be the last time to view the current excavations on the site and learn all that has been discovered about the site’s history. Adults:£3; children free. Car parking £2.50. No booking required. A 2km (1.25 mile) guided walk exploring the Battle of Bosworth, the death of King Richard III and the unlikely victory of Henry Tudor. Enjoy a guided tour of one of Leicestershire’s finest medieval sites. The tour is free. Normal admissions apply: Adults £4.70, Concessions £4.20, Child £2.80, Family £12.20; English Heritage Members & under fives free. 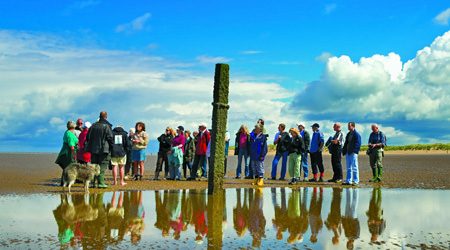 Each Wednesday, Saturday and Sunday of the Festival of British Archaeology 2014 we will be offering two guided tours. The 2pm tour will take a route through the village itself and look at how the village has changed over time. The 3.30pm tour will walk out to Castle Hill to view the earthworks of a Motte and Bailey Castle. £2 per person. Visit the 7th Year of monthly digs by the Leicestershire Industrial History Society and see the engine house & boiler bases uncovered and consolidated, The Fan House is now being investigated with associated ventilation tunnels & drains. Finds include small artefacts and an unidentified circular structure. Come & tell us what you think it all means! Enjoy a 50 minute tour of Leicester’s Roman Bath House, with replica objects to handle. Donations to Friends of Jewry Wall. Grace Dieu Priory, near Thringstone, Leicestershire. Meet at the Bull’s Head Car Park, LE67 8LR. Walk through the ancient Grace Dieu Woods, under the Charnwood Forest Railway and along the Charnwood Forest Canal to the picturesque ruins of Grace Dieu Nunnery which was later a Tudor mansion. A Friends of Grace Dieu event. Local expert, Bruce Townsend, will take you on a walk of about one mile around the tiny hamlet of Cavendish Bridge, which lies on the North West boundary of Leicestershire and at one time extended into Derbyshire. Take the minor road immediately before the modern bridge over the Trent and continue past the Old Crown down a steep slope which leads you to the car park. This place has a rich history dating back to medieval times. It has witnessed a Civil war battle, riots, plundering of its warehouse perhaps even smuggling! Archaeology abounds. Jewry Wall Museum, St Nicholas Circle, Leicester, LE1 4LB. Join the Friends of Jewry Wall Museum, for a free guided tour of their favourite treasures. Meet at the Museum entrance. Join Leicestershire Archaeologist, Peter Liddle, for a leisurely walk around this little known prehistoric hill fort. See the results of recent LIDAR survey. Adults:£3; Children FREE. Car parking £2.50 (correct change needed for barrier) No booking required. Tuesday 15th July: 2pm – 4pm, Saturday 19th July: 2pm – 4pm Foxton Canal Museum, Middle Lock, Gumley Road, Foxton, LE1 7RA. Enjoy a site and museum tour with our expert Mike Beech to celebrate the bicentenary of the canal. Discussing what is hidden under the ground and how it has been investigated to bring the site alive. Suitable for people of all ages, these will be small parties and all questions can be answered. Not suitable for those with mobility problems. This is a walk that takes us back through the geological and social history of Markfield. It will cover typical village life in the nineteenth and early twentieth century and how this was influenced by the geology, communications and landscape. Walkers will be able to see the recent success of turning the legacy of old quarry workings into a public amenity and nature reserve. The walk over Markfield Hill provides splendid views of Charnwood Forest and several neighbouring counties. There is some rough terrain and steep tracks. People are advised to use suitable footwear. Join the Leicestershire Industrial History Society for a trip into the first 100 yard section of this Grade II listed Leicester City Council Owned structure, built by the Stephenson’s as part of the Leicester to Swannington Railway. Numbers are strictly limited and must be pre-booked. Responsible children only if accompanied and controlled. High power torches useful, stout shoes essential. No car parking, toilets or medical facilities on site. Visits start in Village centre & involve a half mile walk along old railway trackbed, through a private estate to the tunnel entrance where visitors are signed in and taken into tunnel under instructions from LIHS stewards. The tunnel is obviously dark & can be cold with some rough conditions underfoot but generally dry. Head covering recommended. PRE-BOOKING ESSENTIAL – Casual visitors NOT allowed. Presentation on John Wycliffe Rector of Lutterworth from 1374 until his death in 1384 who during this time completed the 1st translation of the bible into English followed by a tour of his church, a Grade 1 listed building which contains several 14th century artefacts, an excellent example of a ‘Doom’ and other wall paintings. Join Ratby Local History Society for a walk to an Iron Age fort at Bury Camp and a 13th century moated farm at Old Hays, Ratby. £2. No dogs. Join Peter Liddle to visit ‘Piggy’s Hollow’, one of the best moated site complexes in Leicestershire which includes the site of the manor house, fishponds and a mill dam next to Evington Parish Church, which will also be open. A hidden gem! Join Betty Cawte for a guided stroll to study the archaeology of Staunton Harold including the church, ice house, deserted village and dovecote, and to hear the history of the house and gardens. There is a display in the chapel. Join Chris Wardle, the City Archaeologist, for a walk around the Abbey ruins. There will be other fun activities and a display of old Abbey Park to view. Delia Richards, the Curator of Castle Donington Museum, will lead a walk around historic Castle Donington, an ancient settlement with a fine medieval church and many other interesting features. The walk will take about 2 hours. Join our costumed guide as they explore the magic and mystery behind the history of Bosworth Battlefield in this fascinating walk. 1½ hours. Pre-booking advisable. Betty Cawte and Peter Liddle will guide you around the priory church which boasts one of the best collections of Anglo-Saxon carvings in the country. Also walk around the newly cleared banks of the Iron Age hillfort. Join Brian Ward of Desford and District Local History Society for a leisurely stroll around the conservation area in Desford, with a short time in Desford Free Church where you will be able to see some pictures of Desford in the past. The owner of the Tropical Birdland has kindly made available the toilet facilities, car park and cafeteria for people attending the event on the day, also 20% discount on the admission price for those who wish to visit Birdland. The previously advertised walk through Fosse Meadows to view prehistoric sites has been postponed but will be re-arranged when crops allow contact Malcolm Lockett (01455) 634765 for further information. Dogs deserve the opportunity to enjoy and share the glorious heritage of Swannington, so bring them with you on this guided walk (Maximum of one dog per adult). Starting at the former Snibston No 3 colliery,head down the Swannington Incline (the western end of Robert Stephenson’s 1832 Leicester and Swannington Railway). Proceed through the historic village and national forest planting crossing an 18th century horse drawn tramway to the 200 year old Hough Mill, Gorse Field and Califat Spinney for lunch. Join Leicestershire Industrial History Society in the exploration of an ongoing excavation of the engine house at the mid 19th century Califat mine. Return walk via a different route or you may choose your own route. Pre-booking is helpful but not essential, as it lets us know the potential numbers. Monday 14th July: 7pm – 8.30pm. Harborough Museum, Symington Building, Adam and Eve Street, Market Harborough, LE16 7AG. Join archaeologist Peter Liddle for a talk on how recent discoveries shed new light on Roman religion in Leicestershire and Rutland. We will start with the remarkable Hallaton Treasure site and look at how religious practice developed over the ensuing 400 years. Peter Liddle, of Leicestershire Fieldworkers, will explain in an illustrated talk what we know of the archaeology of the Oadby and Wigston area. There are Bronze Age burials, Roman farms and perhaps a Roman temple, Anglo-Saxon cemeteries and medieval villages amongst what has been found there. There will be the chance to handle some finds and sign up for a new group to discover more about local archaeology. Come along to a talk by archaeologist, Peter Liddle, on working with Time Team in Leicestershire. Find out about the big digs at Great Easton and Medbourne and main programmes at Stonton Wyville, West Langton and Groby Old Hall. The talk will cover how programmes are put together as well as the archaeology. Library members: £2.50 Non-members: £3.50. Please call 0116 305 8763 to reserve. Pre-booking essential. An illustrated talk chronicling these powerful and influential characters, from Saxon battles to John of Gaunt. Rebellion, religion and executions! Light refreshments available. Thursday 24th July: 7.30pm – 9pm. Oakham Castle, Castle Lane, OAKHAM, Rutland, LE15 6DR. Peter Liddle will talk about the Anglo Saxon Archaeology of Leicestershire and Rutland with special reference to recent finds, especially in Rutland! Go back 800 years and become a member of a family that is operating a bell pit then simulate their day being lowered 30 feet into a dark, dank hole for a back breaking day chipping coal from the sides of the pit and loading the baskets. Explore the Califat Spinney, Gorse Field and the 200 year old Hough Mill where you can grind wheat into flour and be weighed on the sack scales. Join Leicestershire Industrial History Society in the exploration of an ongoing excavation of the engine house at the mid 19th century Califat mine. Learn about Prehistory through handling artefacts, making objects and exploring artwork. FREE. Suitable for children of all ages. Join us for demonstrations of flint knapping, fieldwalking techniques, finds handling, a demonstration of techniques used in the identification of materials and the conservation of artefacts and much more. Talk by Peter Liddle on Time Team in Leicestershire at 2.30pm. Saturday 19th July. 11am – 3pm. Ashby Museum, North Street, Ashby de la Zouch, LE65 1HU. Discover the past of Ashby de la Zouch. A day for all the family where you will be able to explore the archaeology of the area. Enjoy games and quizzes and get the chance to identify real archaeological finds. Be inspired by Roman art and create your very own mosaic tile to take away with you (suitable for children 3 and above). £2.50 per child. Come and meet our recruitment sergeant while he tries to recruit you for the war effort. Handling items will be available and a chance for you to find out what it was like as a soldier. Children’s crafts will be available. Have a go at making a sweetheart pin cushion, medals and WW1 style embroidered postcards. Crafts suitable for ages 4-11 A small charge on the day for craft sessions. Have an opportunity to see our exhibition ‘A Call to Arms – Rutland in the First World War’. FREE but small charge for craft activities. See and handle exciting new 3D prints of the Hallaton Helmet and cheek pieces. Try on Roman helmets and armour, make your own helmet to take home and have a go at designing a helmet cheek piece! Come and join the Charnwood Roots Community Dig in Anstey or find out what has been discovered. Anstey residents will be digging test pits around the village centre with the help of volunteers and University of Leicester archaeologists to find out more about the village’s early history. Have-a-go archery including trying your hand with a long-bow! Displays and talks on the history of archery through the ages. Craft activities and museum trail. Light refreshments available. The Festival in Leicestershire is supported by: Leicestershire County Council; Leicestershire Fieldworkers; Leicestershire Archaeological and Historical Society; Leicestershire Heritage Forum: CBA East Midlands. Leicestershire and Rutland have a vibrant archaeological scene. New members are always welcome at all the local groups. Come along to the many events during the week and talk to members of the various groups, or contact the following organisations who will be delighted to see you. Find out more about archaeology in Britain by joining the Council for British Archaeology or its Young Archaeologists’ Club – please visit www.archaeologyuk.org for more information. This page was added on 30/06/2014.